Discover the candlestick strategies that can be combined with options to squeeze more profits from every trade. Our goal is to help you become the best trader possible by showing you how to fully exploit candlestick charts to help increase profits and decrease risk. That’s why these Candlestick Secrets for Options training programs are so important to your education. These video training sessions are so comprehensive … so loaded with “ready-to-use” methods, tips, techniques, and ideas … you’ll be ready to trade like a pro. I divulge many of the very same secret trading tactics that I have taught to market makers, institutional traders and professional hedge fund and money managers around the world. It’s a perfect way for beginners to start, but it’s also well suited for experienced traders who want to make sure they’re using candlesticks correctly to achieve supreme timing entering and exiting option trades in any time frame. 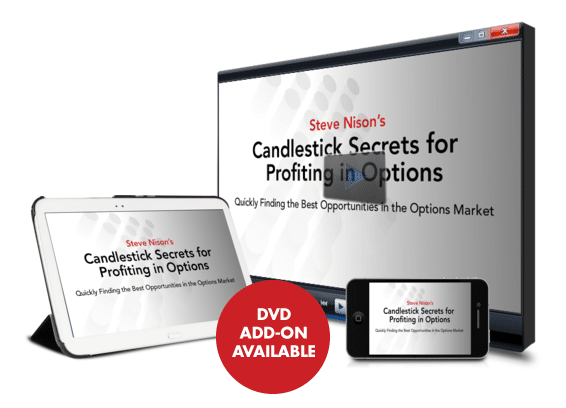 Your purchase of all three of these options training volumes gives you free admission to our Candlecharts.com Options University for ongoing education and information. This gives you access to additional “Test your Knowledge Charts” … exclusive webinars not open to the general public … our ‘Front of the Line” secret email address to ask questions on any topic in the entire training program. This Candlecharts.com Options University bonus is exclusively available to those who order directly from Candlecharts.com. "I especially liked the way Steve taught us how to define your confidence level for each trading opportunity, how to select the appropriate option strategy for that trade and how to adjust the trade should that be necessary. Steve’s presentation was, by far, the best options course I have ever attended. Thanks, Steve!" "I use Steve’s candles now for bigger profits on quickly caught reversal plays 'ahead of the flock' with options."